Mars has two small, asteroid-sized moons named Phobos and Deimos. From the point of view of the rover, located near the equator of Mars, these moons occasionally pass in front of, or "transit," the disk of the sun. These transit events are the Martian equivalent of partial solar eclipses on Earth because the outline of the moons does not completely cover the sun (in contrast, Earth's moon does block the entire sun during a total solar eclipse). These eclipses, like those on Earth, occur in predictable "seasons" a few times each Mars year. 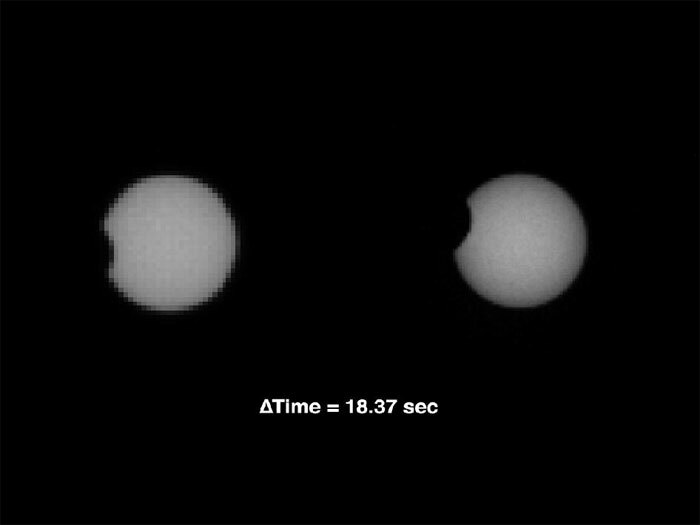 As part of a multi-mission campaign, NASA's Curiosity rover is observing these transits, the first of which involved the moon Phobos grazing the sun's disk. The event was observed on Martian day, or sol, 37 (September 13, 2012) using Curiosity's Mast Camera, or Mastcam, equipped with special filters for directly observing the sun. In a series of high-resolution video frames acquired at about three frames per second for about two minutes, the outline of part of Phobos blocked about five percent of the sun. This animation shows the transit as viewed by the Mastcam 100-millimiter camera (M-100) in nine frames. Another version of the animation is available, consisting of 20 frames taken by the Mastcam 34-millimeter camera (M-34), which has about one-third the resolution of the M-100. In total, 256 frames were taken by the M-100 and 384 frames for the M-34. The transit was also observed by Curiosity's Rover Environmental Monitoring Stations (REMS) instrument, which saw about a five percent drop in the sun's ultraviolet radiation during the event. Mission scientists use these events to very accurately determine the orbital parameters of the Martian moons. Phobos, for example, orbits very close to Mars and is slowly spiraling in to Mars because of tidal forces. These forces change the orbital position of Phobos over time, and accurate measurements of those changes can provide information about the internal structure of that moon and how it dissipates energy. Deimos orbits much farther away and is slowly spiraling out. NASA's Mars Exploration Rover Opportunity will also attempt to observe a different set of Phobos and Deimos transits, seen from the other side of the planet, in Meridiani Planum. As part of a multi-mission campaign, NASA's Curiosity rover is observing Martian moon transits, the first of which involved the moon Phobos grazing the sun's disk. The event was observed on Martian day, or sol, 37 (September 13, 2012) using Curiosity's Mast Camera, or Mastcam, equipped with special filters for directly observing the sun. This image layout compares views from the Mastcam 34-millimeter lens (left) and the Mastcam 100-millimeter lens, which is designed to take zoomed-in shots with about three times higher resolution. These images were taken about 18 seconds apart. This mosaic from the Mast Camera on NASA's Curiosity rover shows a close-up view looking toward the "Glenelg" area, where three different terrain types come together. All three types are observed from orbit with the High-Resolution Imaging Science Experiment (HiRISE) camera on NASA's Mars Reconnaissance Orbiter. By driving there, Curiosity will be able to explore them. One of these terrain types is light-toned with well-developed layering, which likely records the deposition of sedimentary materials. There are also black bands that run through the area and might constitute additional layers that alternate with the light-toned layer(s). The black bands are not easily seen from orbit and are on the order of about 3.3-feet (1-meter) thick. Both of these layer types are important science targets. 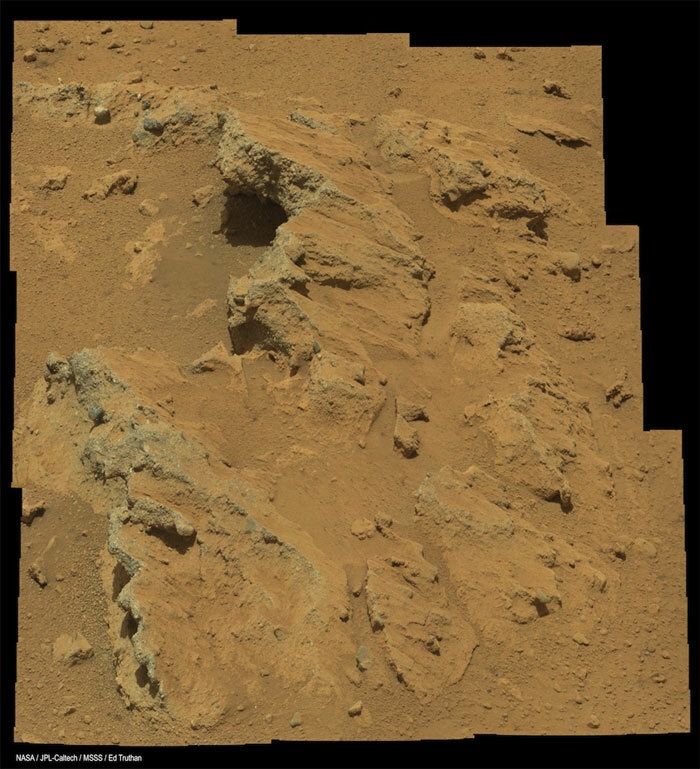 This mosaic is composed of images taken with the Mastcam 100-millimeter camera. This mosaic from the Mast Camera on NASA's Curiosity rover shows the view looking toward the "Glenelg" area, where three different terrain types come together. All three types are observed from orbit with the High-Resolution Imaging Science Experiment (HiRISE) camera on NASA's Mars Reconnaissance Orbiter. By driving there, Curiosity will be able to explore them. One of the three terrain types is light-toned with well-developed layering, which likely records deposits of sedimentary materials. There are also black bands that run through the area and might constitute additional layers that alternate with the light-toned layers. The black bands are not easily seen from orbit and are on the order of about 3.3-feet (1-meter) thick. Both of these layer types are important science targets. This mosaic is composed of seven images. The Mastcam 34-millimeter camera took a series of four images; embedded within that series is a second set of three images taken with the Mastcam 100-millimeter camera. 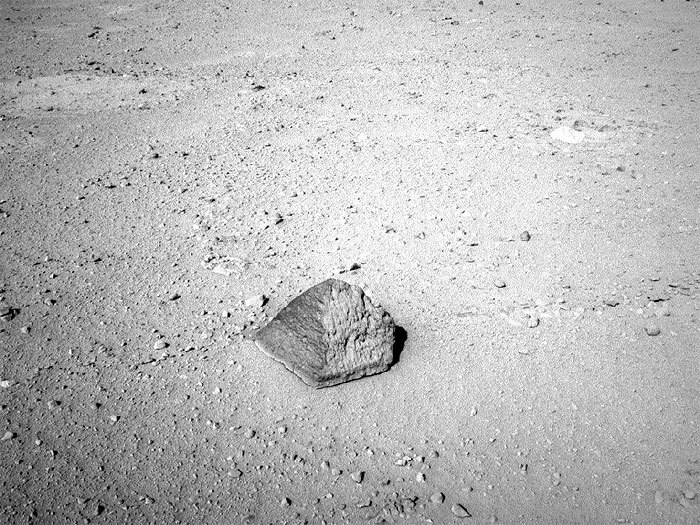 The drive by NASA's Mars rover Curiosity during the mission's 43rd Martian day, or sol, (Sept. 19, 2012) ended with this rock about 8 feet (2.5 meters) in front of the rover. The rock is about 10 inches (25 centimeters) tall and 16 inches (40 centimeters) wide. The rover team has assessed it as a suitable target for the first use of Curiosity's contact instruments on a rock. The image was taken by the left Navigation camera (Navcam) at the end of the drive. The rock has been named "Jake Matijevic." This commemorates Jacob Matijevic (1947-2012), who was the surface operations systems chief engineer for the Mars Science Laboratory Project and the project's Curiosity rover. He was also a leading engineer for all of the previous NASA Mars rovers: Sojourner, Spirit and Opportunity. Curiosity's contact instruments are on a turret at the end of the rover's arm. They are the Alpha Particle X-Ray Spectrometer for reading a target's elemental composition and the Mars Hand Lens Imager for close-up imaging. 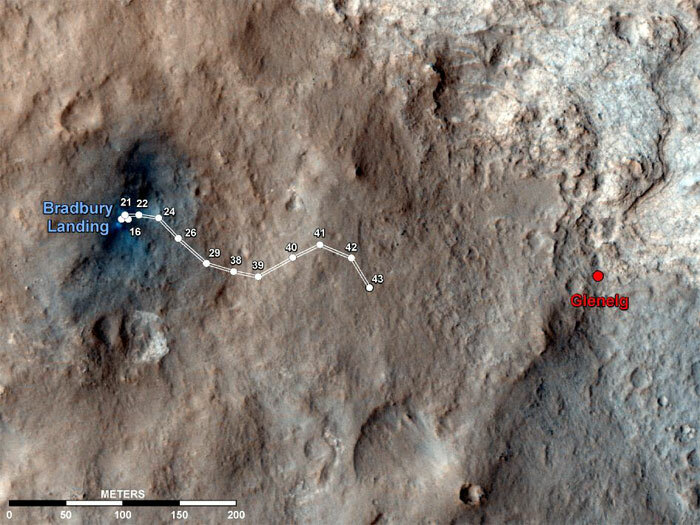 This map shows the route driven by NASA's Mars rover Curiosity through the 43rd Martian day, or sol, of the rover's mission on Mars (Sept. 19, 2012). The route starts where the rover touched down, a site subsequently named Bradbury Landing. The line extending toward the right (eastward) from Bradbury Landing is the rover's path. Numbering of the dots along the line indicate the distance driven each sol. North is up. The scale bar is 200 meters (656 feet). 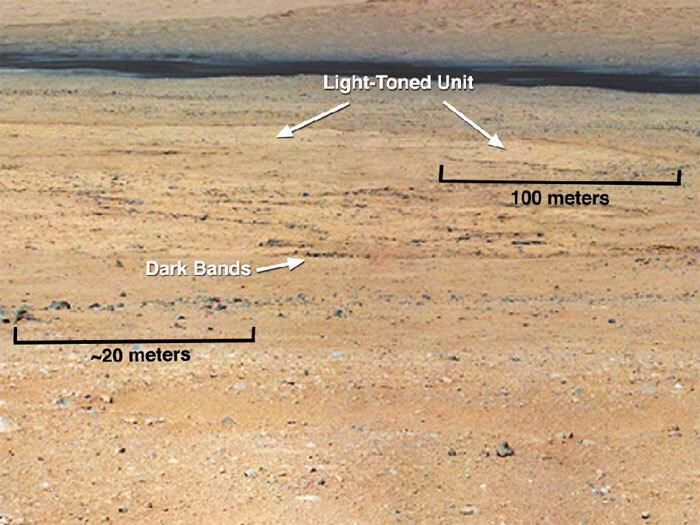 By Sol 43, Curiosity had driven at total of about 950 feet (290 meters). 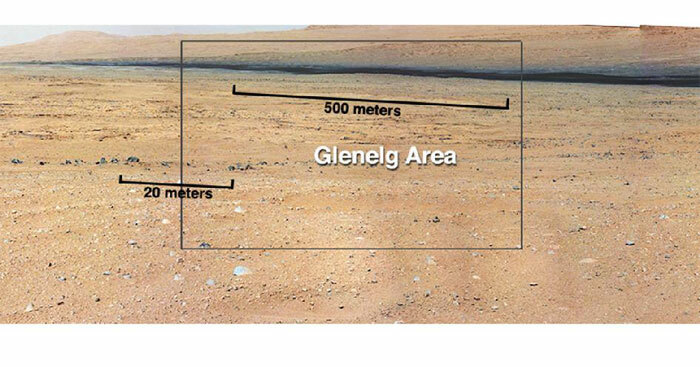 The Glenelg area farther east is the mission's first major science destination, selected as likely to offer a good target for Curiosity's first analysis of powder collected by drilling into a rock. The image used for the map is from an observation of the landing site by the High Resolution Imaging Science Experiment (HiRISE) instrument on NASA's Mars Reconnaissance Orbiter.